Two large, thin, well done pieces of meat arrived with french fries; washed down by a bottle of Coca-Cola which had me burping as well. It was all too clear that my unplanned night in this exotic country would yield little in the way of new experiences. Adding insult to intestinal agony, any faint hope of a good night's sleep was scratched when I retired to my room and heard the chorus of stray dogs barking outside the hotel. It was 1 AM in Addis Ababa, Ethiopia. Two days earlier, I received a text message moments before getting into a taxi to Dulles International Airport for my 10:30 AM flight. There was a 10-hour delay and I was suddenly leaving at 9 PM instead. Excitement about the start of my Rwandan adventure immediately gave way to anxiety about my late arrival. After confirming with the airline that mechanical problems with the aircraft in Rome were at fault, I returned to bed. Text messages continued to arrive; each one bumping my flight later and later, and my anxiety higher and higher. At 7 PM, after driving the taxi dispatcher crazy all afternoon, I hopped in a cab and sped off to the airport. Eight months earlier, almost to the day, I had arrived at the same airport having completed a 20-month trip around the world. Dulles was eerily quiet; only one man was ahead of me at the Ethiopian Airlines counter for check in. For a reason still unbeknown to me, I was unable to check my main backpack. I knew this would lead to a reckoning at the security checkpoint. As expected, my backpack was flagged by the x-ray screener for a hand search. The end result was the confiscation of my Swiss Army knife, which I took on a whim for no particular reason, and a full bottle of my favorite spray sunscreen. To pass the time, I took a table at Moe's Grill and Bar in Terminal D, near Gate 23. I ate a quickly prepared order of chicken tenders, and in an uncharacteristic move, drank two cups of coffee. The caffeine, mixed with adrenaline, made me feel far too hyper for that time of night. Around 11: 30 PM, my flight finally departed for the 8 1/2 hour trans-Atlantic journey to Rome. 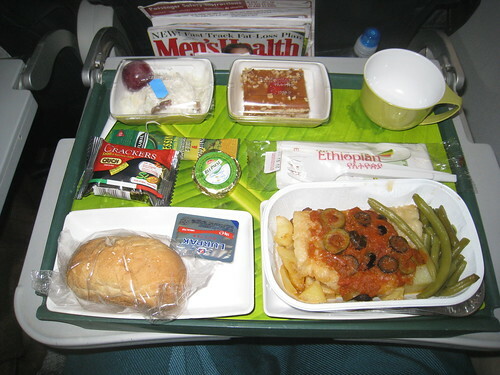 Seated directly over the right wing, and seemingly the last to receive dinner, I was relegated to eating fish. On the plus side, the in-flight movie was “Up In the Air” which I enjoyed for the second time. Sleep happened in one hour bursts. 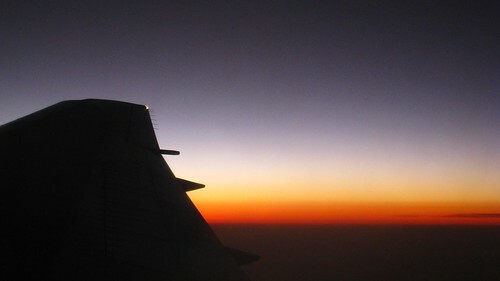 After refueling in Rome, we took to the air for another 5 1/2 hours en route to Addis Ababa. It wasn't until we were about to land that I fully accepted the fact that there would be no connecting flight to Uganda that night. The staff of Ethiopian Airlines greeted each passenger as they disembarked with a rose; a small consolation for an enormous schedule disruption. In the corridor leading to the transit lounge, I received a revised boarding pass for the morning's flight, and a voucher for a free night's hotel stay. To the airline's credit, I didn't have to pay a dime for the inconvenience. 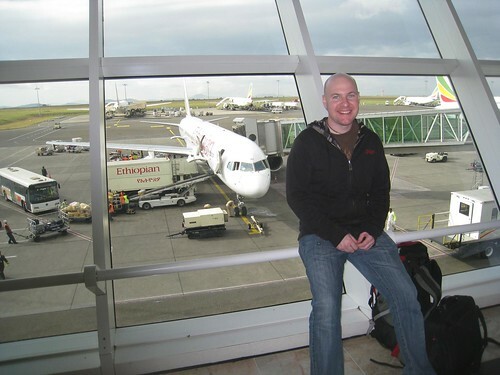 The next morning, I was back at the Addis airport having benefited from a briefing on Rwanda over breakfast by Stuart, a Yale grad spending a gap year volunteering in the country. 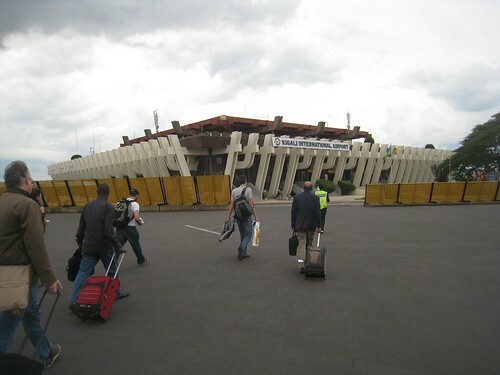 The 1 1/2 hour flight to Uganda went according to plan, as did the shorter 30-minute one past Lake Victoria to Kigali. Jetlagged and incontinent, with a full day ahead, my adventures in Rwanda had just begun. Not able to check your backpack? Between that and your long delay it sounds rough, but I'm sure it was totally worth it. Can't wait to see pictures and here more! Yea, I thought it was weird. Maybe I was one of the last arrivals at the airport for the flight, and they’d stopped checking bags in. I still don’t think it was too fair that through no fault of my own, I then had to toss a few of my possessions. At least the investment in smaller toiletries paid off. Ugh, airline mechanical problems, when will they ever end? Sorry to hear you were delayed getting there, can't wait to hear more stories though! Ah Addis… which hotel did you stay in? There were only two 'real' ones in Addis Ababa when I was there. I think it was called Pacific Hotel. It was about a 10 minute drive from the airport, and seemed fairly new. That is great. The reason I remember the Sheraton and the Hilton was because those were the only places in the entire city I could find an ATM to use. Looking forward to reading about the rest of your adventure and seeing the pictures. Thanks for keeping up with my Rwandan adventure. I'm still reflecting on the whole experience – we covered a lot of ground in one week. Very interesting post. I enjoyed it reading. If I never have to see Addis airport again, I'll be a happy girl. Ahh, Anna, I know exactly how you feel. It's a long haul to Rwanda from the US!